American politics are polarized by a two-party system in which each major party appeals to those furthest from the center. This polarization has been credibly blamed for significant dysfunction in our government, and high citizen dissatisfaction. According to Michael Porter and Katherine Gehl, writing in a September 2017 white paper published by Harvard Business School, confidence in our government has declined from 73 percent in the late 1950’s to 20 percent in 2017. Contributing to the dissatisfaction and dysfunction is how the two major parties write election laws. These laws exclude citizen participation and quash competition for votes. The major parties’ disdain for an open, competitive electoral process extends to blatant violation of the Constitution and federal court decisions. This is on prominent display in Connecticut. Connecticut’s Secretary of the State (SOTS) is the gatekeeper who controls all aspects of ballot access in Connecticut. The SOTS uses this control to keep citizen candidates off the ballot. In Connecticut, an independent (unaffiliated) candidate for political office– or a candidate associated with a party that has not recently run a candidate for the office sought – must petition for ballot access by collecting the legally prescribed number of signatures. These signatures must be collected on a petition document issued by the SOTS. Because the purpose of the petition is to put a candidate on the ballot, the petition signers must be registered voters in Connecticut. The individuals who gather signatures, sometimes campaign volunteers, sometimes paid campaign workers must, under Connecticut law, be Connecticut residents. Getting the petition form and then collecting the needed signatures is the heart of gaining ballot access – being able to participate meaningfully in an election, and putting new ideas in front of the voters. Gathering signatures can be as simple as talking to a few friends for a candidate you know, or it may mean standing in the rain, snow or heat for hours, talking to sometimes unfriendly, often indifferent, people and asking them to sign some type of government document for who knows what purpose. Not so easy. Because gathering enough qualified signatures for ballot access is not easy, firms around the country will supply people to collect the necessary signatures for ballot access — often bringing these signature collectors in from several states away. For aspiring candidates, qualified signatures are the lifeblood of political dialogue without which they can have no voice. Depending on where you are in the country, and when in the election cycle, hourly pay rates for signature collectors may start at $20/hour and can easily exceed $40/hour or more. For relatively unskilled work, this is a high pay rate and shows the importance of the task, and how difficult it can be to get people to do the job. Connecticut’s requirement that signature collectors (circulators) be Connecticut residents imposes a heavy burden on independent candidates. It deliberately and arbitrarily limits the worker pool that independent candidates can use to gain ballot access. This insulates the major parties from competition. With fewer candidates on the ballot, it is less likely that independent candidates will be taken seriously or elected. In late 2015, the Libertarian Party of Connecticut knew that they wanted to place a Libertarian candidate for President on the ballot in Connecticut. Because the Libertarians had not run a candidate for President during the previous election cycle, they were compelled to petition for ballot access just like any independent candidate. From previous experience, the Libertarians knew that Connecticut’s limitations on signature collectors could make ballot access impossible. 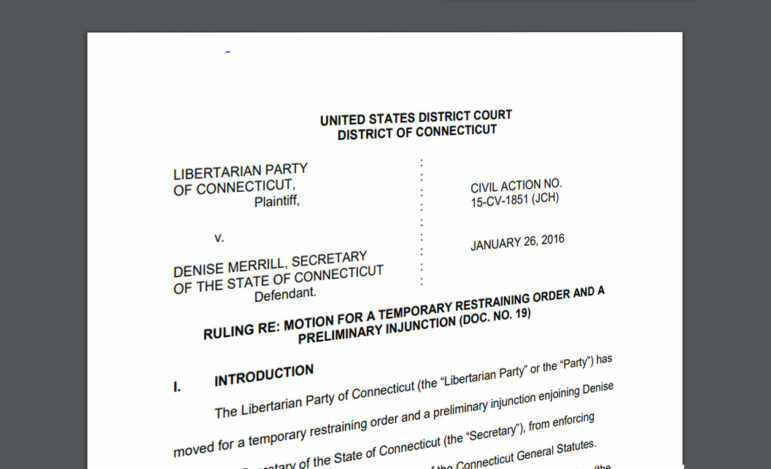 Supported by the ACLU of Connecticut and local counsel, in December 2015, the Libertarian Party of Connecticut sued the Connecticut Secretary of the State in federal court. The Libertarians claimed that Connecticut’s statutes limiting persons who can collect signatures has caused them to be denied ballot access in the past. The Libertarian Party explained that limiting signature gatherers to Connecticut residents gives those residents a monopoly in this work. This reduces any candidate’s ability to negotiate favorable terms, and makes it more costly or even prohibitively costly to gain ballot access. Beyond this, the Libertarian’s legal brief stated that the national Libertarian Party’s experience was that professional out-of-state circulators generated a significantly higher percentage of qualified signatures than the few, professional in-state signature collectors or volunteers. The Libertarians showed that the Connecticut statute demonstrably burdened independent candidates in gaining ballot access and materially restricts their political speech. In its legal brief, the Libertarian Party asked the federal court to enjoin the enforcement of Connecticut statutes that unconstitutionally restrict core political speech by requiring signature collectors to be Connecticut residents. In January 2016, just about a month after the Libertarian Party filed its complaint, Judge Janet C. Hall of the United States District Court for the District of Connecticut ruled that Connecticut’s statute related to signature gatherers (circulators) is unconstitutional and a violation of the Fourteenth and First Amendments to the U.S. Constitution. Based on these findings, Judge Hall enjoined the SOTS from enforcing these statutory provisions and continuing to obstruct ballot access. Despite Judge Hall’s clear 2016 ruling, Connecticut’s offending laws remain on the books in 2019. During the 2018 election cycle, the SOTS vigorously enforced this unconstitutional statute, telling independent candidates that signature gatherers must be Connecticut residents. In addition, the SOTS duplicitously highlighted this requirement by underlining the words . .”a resident of a town in this state . . .”. in printed forms it provided to independent candidates and on the SOTS website. Connecticut’s unconstitutional limitations on ballot access are still on the books and continue to block candidates and voters. Moreover, Connecticut’s SOTS continues to burden all independent candidates with other onerous requirements on the road to ballot access – requirements to form a party, delays in reviewing and approving signatures, delays in issuing the all-important petition itself so that independent candidates are delayed in even starting their campaign efforts. All such burdens which permit incumbent office holders to arbitrarily sift, sort and block independent and minor party candidates, while major party candidates go directly to the ballot, weaken each of us. It justifies further distrust of and dissatisfaction with our government. Connecticut can once again be proud to call itself the Constitution State when it truly honors the Constitution and allows government to be of, by, and for the people rather than for a two-party duopoly which restricts ballot access and robs voters of true choice. Marisa Manley is a business owner and graduate of Harvard Law School. 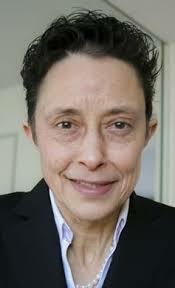 She lives in Connecticut and ran for governor in 2018 as an independent candidate.